Six times, I have prepared for a trip to Ghana. I’ve anticipated each trip differently. Sometimes I’ve been very excited about going, like that one time where we thought we’d sell everything to move there. Other times I’ve worried about it because the responsibilities seemed great. I can remember a particular tumultuous time in my family’s life and a trip to Ghana felt like the very wrong thing to do at the time. But the ticket had been booked and I had to go. I remember bawling as I walked through customs. The agents and officers were very concerned for me and I was whisked through every line with an accompanying pat on the back. I highly recommend this tactic for ease of travel. I’m now preparing for my “final trip,” as in the last time I will go to Ghana for the purpose of doing business. If and when I go again, after this trip, it will be for the mission… although ONE DAY I will go just to spend time with my lovely friends there. Just visiting with them seems like an exorbitant luxury. This time, it’s not my business, it’s the business of the new owners of Big Village, the fair-trade business I started by accident when we moved back to Canada. I’m actually allowing myself to get excited about this trip! I get to introduce them to this beautiful place, these welcoming people. I get to tell them to ignore the Travel Report because there is no context given for the warmth and friendliness of the place that I’ve known for over six years now. The new owners of Big Village have done some amazing things already with the business. They’ve already gained a couple fantastic contracts and are making new partnerships all the time. I spent some time with them the other day and got so excited about their plans and developments, I had to tell John-Mark all about it as soon as I got home. “They are doing so, so, so well!” I said. “Do you wish it was you?” he asked. Jerk. What a great peace I have about it, to know that I could be so very happy for them and their success and not want even a smidge of it. Not only that, but I had suspected God was pulling me deeper into ministry. I didn’t know how to say that any other way. I wrote about it when I sent out that final newsletter to my customers back in the fall. I imagine that many didn’t understand because I couldn’t articulate exactly what that would look like, where it would be, or how that sentiment would pay the bills. Mostly it was J-M asking me about that last one. I prematurely told my friends, don’t worry, I’ll ease off on the use of “Ghana” a little now. I won’t add to the end of all your stories, “Well in Ghana…” It is so annoying. I know. I can’t stop. But then as J-M talked to me about the ongoing mission partnership with our church. There is such a great forward momentum happening in Ghana, with new ministerial candidates approved, churches joining in and growing, the land purchase and construction for the women’s college… and yet not a lot of news getting out over here. There is a lot of work to be done, as much as there is work in Ghana. Well, hello! My passion is blabbing, either by mouth or by keyboard. I already talk about Ghana ad nauseum. I already know and love the people on both sides of the ocean who are committed to this project. I can do this! I’d stepped away from the Ghana project for a time – not in heart, but in task – because I needed to. I was feeling a little burnt out by it all. So I made up my mind after an intense debrief with good counsellors who said it was OK to let go. Rob Corey stepped in just in time and had the exact skills and energy necessary to take this partnership to the place where it is now. Since then – for 2+ years – I’ve been a big cheerleader, especially for J-M, who saw his job morph into the position of Pastor of Missions. He now co-leads with Rob on the project and they have a great planning team. But as I mentioned, it’s growing! It’s growing in a way that needs full-time support. I find myself with some time on my hands, a desire to spread the word, and the ability to do it. With Rob and J-M at the helm and a great team besides. All I need to do is write words? All I need to do is tell people about it? No brainer! Now as I pack my bags for Ghana (that I’m getting really good at), I find myself again thinking of new possibilities, ways to communicate, pictures to take, questions to ask, stories to tell. And still I feel the pull deeper. One of my self-appointed tasks is to track down photos from old teams and projects to help us have a good memory of the project and how far we’ve come along. This is also distracting me from packing because I discover pictures that move me to tears. I see the friendships that have been formed on both sides. I see the way people connect at a deep level because of the shared love of Jesus. I see us ministering to each other. I’m not saying that there hasn’t been bumps in the road, but there are many, many moments of celebration. When I was going through the photos of our time living there, I was asking J-M which ones I should put on the public site? He said only those that are ministry related. That helps me not at all. 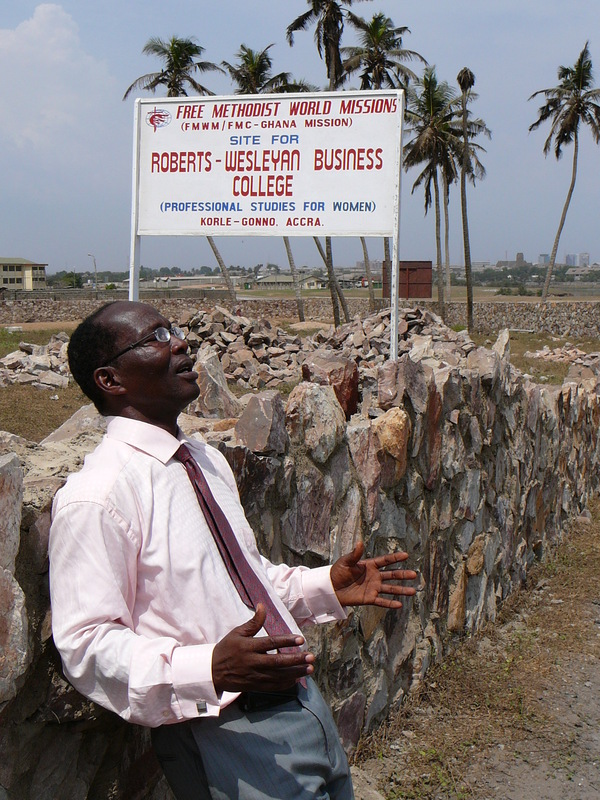 Pastor Charles praying for the future Women’s Business College (2007). 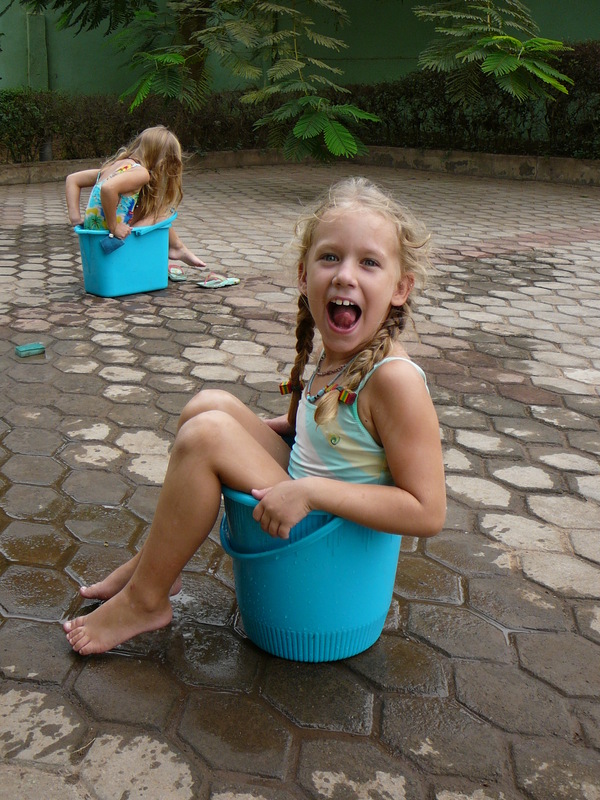 Mallory and Sophia find a unique way to cool off in the Ghanaian sun.